Kathleen Dahill offers voice workshops for speech/singing incorporating proper breathing techniques, strengthening your vocal instrument, and developing your best and most powerful sound. Chris Sweitzer will train your group at your facility on the basics of safe and effective use of technical theater equipment for a variety of events through a series of informative interactive lighting and sound seminars. Morning, afternoon, or evening sessions are available. It’s up to you to decide who attends - faculty, staff, students, or a mix. It’s simple, fun, and hands-on. *No prior technical theater experience required* We provide handout materials for up to 30 participants. This allows for maximum interaction. Click one of the links on the upper right of your screen. We provide cast, crew, set, and props to perform in your venue. Contact us for pricing details. Our latest offering is a hilarious one-woman musical. 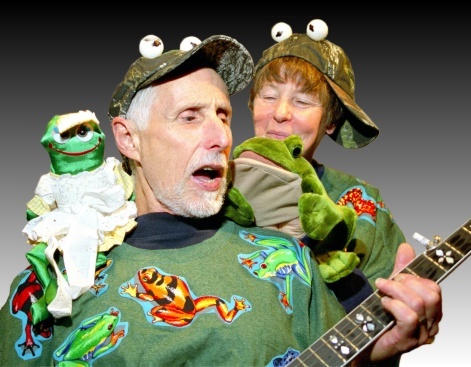 Ted and the Toads perform classic Christmas carols with an amphibian twist!